The River Trent (Figure 1) is the fifth longest watercourse in Britain, running approximately 210km from its source in the Staffordshire Moorlands to the Humber Estuary. The input from tributaries including the Rivers Dove, Derwent and Soar, draining major upland zones, in particular the southern Pennines, results in the second highest mean annual discharge in Britain (Smith and Howard 2004). Forming a natural divide between the highland and lowland zones of Britain, the river exhibits within its course the characteristics of both an upland and a lowland system (Knight and Howard 2004a). 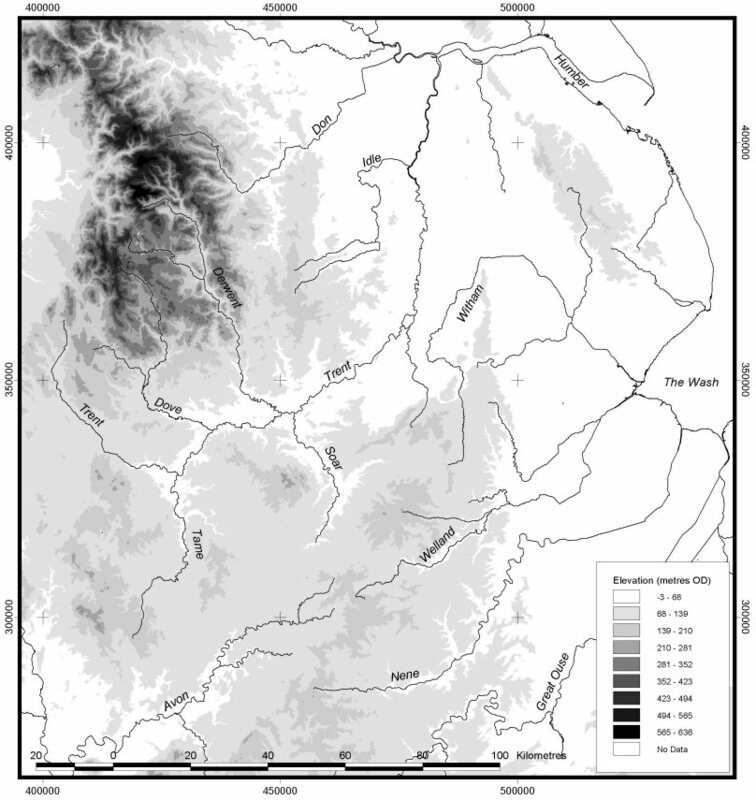 Figure 1: The River Trent: location and topographic context. © Crown Copyright Ordnance Survey. An EDINA Digimap/JISC supplied service. More specifically, all three of the typical valley forms proposed by Howard and Macklin (1999) for the classification of British rivers can be identified within the Trent Valley. Upstream from Weston, Staffordshire, the river can be characterised as a high-energy upland system dominated by coarse-grained sedimentation within a narrow valley floor. The Middle Trent Valley, between Weston and Gainsborough, Lincolnshire, exhibits characteristics of a medium-energy anastomosing and meandering system within a developed floodplain. The lower valley, downstream from Gainsborough, exhibits a broad floodplain dominated by fine-grained sedimentation and increased lateral stability of the river channel. Each zone presents differing problems and potentials for the preservation and visibility of archaeological and palaeoenvironmental material. The dynamic nature of the Trent, particularly in its middle course, is a consequence both of its present configuration and of its Pleistocene and Holocene history. During the late Pleistocene and early Holocene, high discharges associated with glacial meltwaters and low sea levels prompted a period of incision (Lillie and Grattan 1995), creating the present Holocene floodplain. With climatic amelioration, discharge was reduced and the river established its current meander belt among the floodplain gravel terraces (Salisbury et al. 1984; Salisbury 1992). Relative stability in the early Holocene was accompanied by sea level rise prompting alluviation (Howard et al. 1999; Lillie and Grattan 1995) until around 5000 BP. After this time, increased channel mobility is attested by the significant reworking of the floodplain gravels, for example at Langford, Nottinghamshire, commencing around 4800-4200 BP (Lillie 1992). These episodes of reworking are likely to have been initiated by interaction between climatic and anthropogenic factors, and continued into historic times, for example at Colwick, Nottinghamshire (Salisbury et al. 1984), and Hemington, Leicestershire (Salisbury 1992). Although a combination of natural tendency (Brown 1995) and human action (bank protection, navigation works, warping to increase overbank deposition), particularly since the 18th century, has produced a largely single-channel river, there is still significant channel mobility, particularly in the vicinity of major confluences (Large and Petts 1996). The archaeological record in the Trent Valley suggests that the river and its evolving landforms have formed an important locus in the practical and symbolic landscapes of communities through time. In addition, the mobility of the river has resulted in a rich palaeochannel resource preserving both organic and inorganic deposits in varied locations, and the importance of this resource lies in its value for providing a proxy record of climate and land use. The rich wetland mosaic of the middle and lower valley constituted a valuable resource base, providing fish, wildfowl, building materials, and fertile soils on dry gravel islands. During the Mesolithic, this resource formed part of the seasonal round of people moving between the middle valley and the uplands of the southern Pennines (Myers 1989), and it is probable that these mobile patterns of occupation persisted into the Neolithic and Early Bronze Age (Knight and Howard 2004b). Analysis of pollen, plant macrofossils and insect remains from a palaeochannel at Yoxall Bridge, Staffordshire (Smith et al. 2001), in the upper part of the middle valley, demonstrates the local variety of wetland habitats and resources during the Later Bronze Age, with evidence for reed beds, alder carr, mixed woodland and heathland, alongside small areas of grassland pasture and arable cultivation. At Girton, Nottinghamshire, in the lower part of the middle valley, sediments from a peat-filled palaeochannel showed similar conditions up to about 2000 BC, with alder carr and mixed deciduous woodland (Green 1991). In later prehistory, the scope of seasonal mobility appears to have gradually reduced, with extensive settlement evidence on the gravel terraces. Shifting, open, low-density settlement gradually became more nucleated, with enclosed settlement and associated field systems persisting into the Romano-British period (Knight and Howard 2004c). During this period, anthropogenic disturbance of forest cover is suggested by fossil pollen and insect sequences from a backswamp area at Bole Ings, Nottinghamshire (Brayshay and Dinnin 1999), with a reduction in woodland and scrub accompanied by an increase in grassland and reedswamp. A similar process of gradual opening up is indicated by the pollen sequence from a palaeochannel at Langford, Nottinghamshire (Lillie 1992; Lillie and Grattan 1995). Dendrochronologies have been assembled from trees preserved in a palaeochannel log-jam at Langford (Lillie 1992). The resources of the valley continued to be exploited through the medieval period, with fish-weirs and mills proliferating in the river landscape (Elliot et al. 2004). At Hemington, Leicestershire, evidence for fish weirs, bridges, a mill and a mill dam was preserved within a complex of palaeochannels and reworked gravels, dated by archaeomagnetic analysis to between the 7th and 20th centuries AD (Clay 1992; Clay and Salisbury 1990; Ellis and Brown 1998; Cooper 2003). The river also functioned as a rich cultural resource, becoming the focus for funerary ritual and ceremonial acts of deposition, particularly of metalwork. Confluence zones in the middle valley attained a special significance during the Neolithic period, with the Aston and Potlock cursuses located close to the Trent/Derwent/Soar confluence, and the Trent/Tame confluence noteworthy for two causewayed enclosures and the Fisherwick monument complex. Burnt mounds, often associated with palaeochannels, appear to have provided places of periodic communal gathering (Knight and Howard 2004b). The distribution of monuments and material culture suggests that the Trent may have functioned as a social boundary by the Roman period, with stylistic differences in coins and pottery between the 'lowland' and 'upland' sides of the valley (Knight et al. 2004). A cultural divide appears to persist in the distribution of early Anglo-Saxon cemeteries, and in many cases parish boundaries were orientated along watercourses. The river also provided an important corridor for movement, with prehistoric wooden trackways linking the gravel islands and logboats suggesting the movement of commodities by water; the growth of river ports in the medieval period underlines the importance of riverine trade. The rich archaeological record in the valley is therefore closely associated with the river and its landforms. In all periods, the physical configuration of the river landscape was a crucial factor in the spatial resolution of human settlement and in the conceptual landscapes of valley communities. Reconstruction of the configuration of the river in the past is of great value, alongside the archaeological record of human occupation, in understanding how these landscapes articulated. The preservation of organic sediments in palaeochannel contexts has permitted at least partial reconstruction of land-use trajectories in the past, and the calibration of these sequences against firm chronologies. The resulting geomorphological, vegetational and land-use chronologies are, alongside the archaeological record, of great value in elucidating the relationships between human activity, climatic conditions, vegetation and geomorphology (Ellis and Brown 1998). In pursuit of this end, Howard and Macklin (1999) have stressed the importance of the identification and mapping of palaeochannels as one stage in the comprehensive geomorphological mapping of valley floors, alongside dating programmes and assessment of preservation and palaeoenvironmental potential.